This steel-hulled displacement yacht benefits from exterior design by Espen Øino, but not much else is known about this highly secretive project. With a steel hull and aluminium superstructure, she spans five decks and was built to DNV GL classification. Her launch in April 2016 came 31 months after her keel was laid in September 2013. 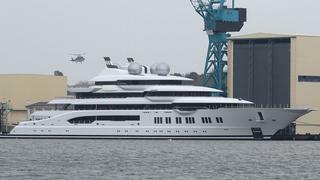 The official LOA of Amadea is yet to be confirmed, with Lürssen only revealing that she is more than 100 metres long. Our Superyacht Directory — the most authoritative directory of all the superyachts in the world — suggests that Amadea is 104 metres long, including a two-metre decorative bowsprit, making her one of the largest superyachts in the world. It is understood that her interiors total 2,999GT and she has been registered in the Cayman Islands. 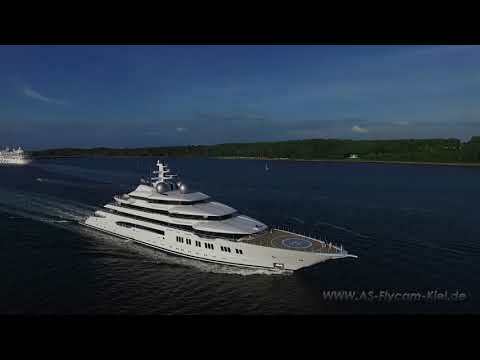 As the drone video below reveals, Amadea boasts a large superyacht helicopter pad on her foredeck. Amadea is now expected to head to the Middle East to join a fleet of other superyachts. Other notable projects currently under development at the German yard include the 123 metre Project Jupiter, which recently returned from its second round of sea trials, and the 74 metre Aurora, which is due for delivery before the end of the year.